So, on this grey, overcast day, with the wind blowing the washing dry (perfect weather for a washing day) I’m sat in the garden with a cup of tea reflecting about the weekend that has passed and the various plays I have seen. I don’t recall learning much about WWII at school. My dad loved war films and war planes, especially Spitfires and so most of my teachings probably came from him. A few years ago, I stayed at a friend’s house in Normandy and we visited the beaches of Gold, Omaha, Juno, Utah and Sword. We drove up to Pegasus Bridge and the museum there and so I knew a little bit about how weather had played an important part of the D-Day landings, but I wasn’t fully aware of James Stagg’s involvement in the success of the mission. 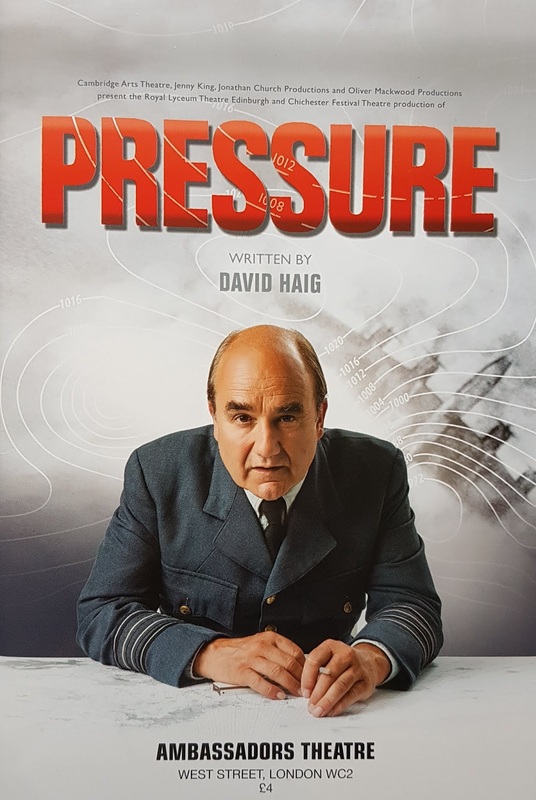 David Haig has changed all of that with his play, Pressure, which tells the story of Dr James Stagg, a Scottish meteorologist charged with forecasting what the weather would be like on Monday 5th June 1944. Weather forecasting had been around since the 1860’s, but the science behind it was still in its infancy. Stagg was convinced that changes in Earth’s magnetic field affected the upper atmosphere which in turn effected the world's weather. His work led him to holding the position of Chief Meteorological Adviser to the supreme commander of the allied forces in Europe. Stagg was charged with forecasting the weather conditions for the D-Day landings, a task confounded by working with Colonel Irving P Krick, an American meteorologist who had conflicting views and opinions on what conditions would be like on 5th June 1944. Krick had been employed by the US Strategic Air Forces in Europe in the Weather Information Centre. 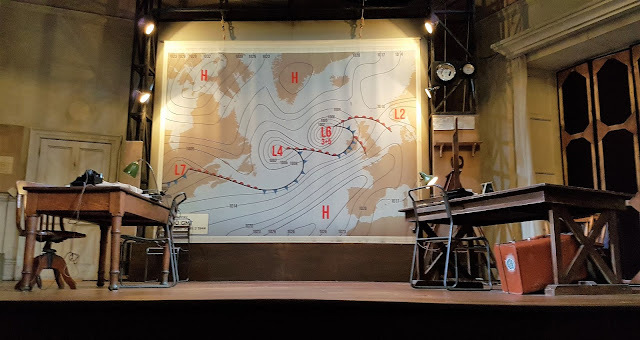 He joined Stagg as part of General Dwight Eisenhower’s team, however, his methods were dramatically different to those of Stagg, preferring instead to pay attention to historical weather charts rather than embracing new science. KRICK:- "There's no proof the jet stream exists." KRICK:- "Okay. This is the weather chart for June 2nd, 1923. And I could have given you June 3rd 1919, or June 10th 1926, all three identical to this chart on the wall." So whose word are you going to follow? The man of new untrusted science, or the man who thinks the weather will follow a similar pattern to his previous years charts? The play beautifully illustrates the pressure that Stagg, Krick and Eisenhower were under to ensure that the D-Day landings would be as successful as possible. David Haig plays the brusque, bad-mannered Scot who as the play unfolds becomes this endearing character that you cannot help but warm too. It was his tenacity that made Eisenhower listen to him. Stagg stood his ground, he didn’t tell Eisenhower what he knew he wanted to hear like Krick did. Stagg believed in himself, and with that he helped save the lives of potentially 80,000 men, by predicting the violent storms that would have capsized the flat-bottomed boats that were due to ferry men across the English Channel. This was a beautifully written piece of history, both compelling and laced with humour, showcasing what was a severely stressful situation people were under. 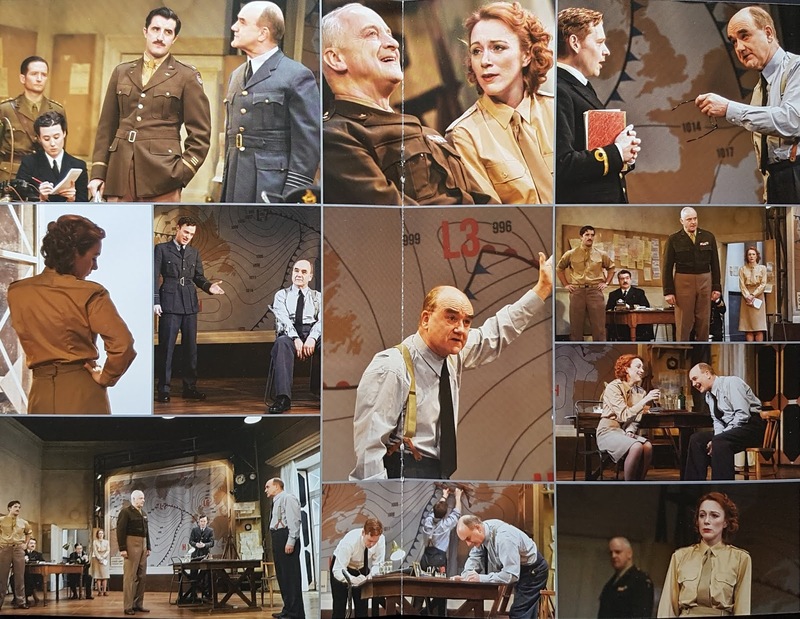 The scenes between both Eisenhower (Malcolm Sinclair) and Kay Summersby (Laura Rogers) and Stagg and Summersby were particularly poignant and added depth and humanity to the piece. As I write, the great British weather does its thing…the sun is now poking it’s head from behind a cloud trying to make up for the morning misery. As Stagg tried to explain to Krick:- "Ten o'clock in the morning, it's baking hot, the beach is packed. By midday, there's a howling wind and the Punch and Judy man has packed up for the day. By two o'clock, the rain is horizontal, but by four o'clock...the sun is beating down again and it's eighty degrees. Nothing is predictable about British weather, that's why we love to talk about it." 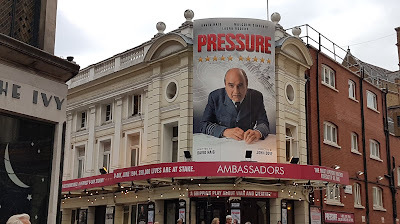 Pressure is playing at The Ambassadors Theatre, London until 1st September 2018.